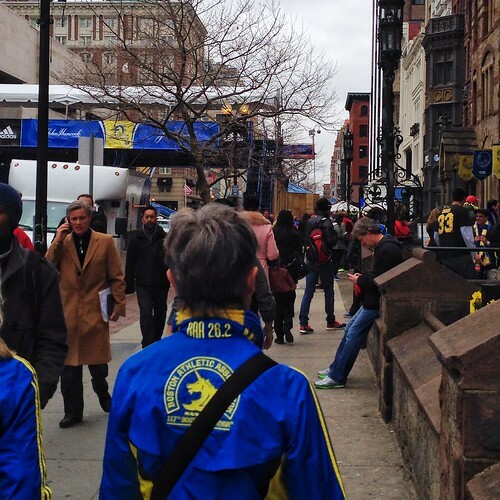 From sorrow to celebration, our trip to the Boston Marathon 2014, one year after being so close to the site of the first bomb, was nothing short of incredible. We took back the day. 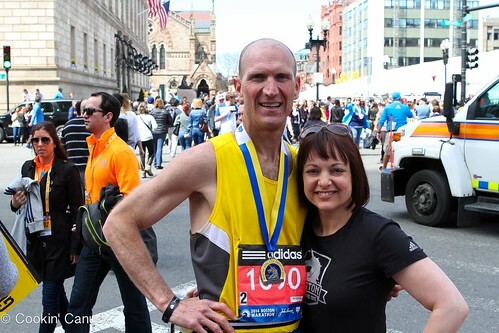 And when I say “we”, I mean our family, the running community, the city of Boston and everyone who watched the events of April 15, 2013 in horror and then watched this year’s Boston Marathon with bated breath. 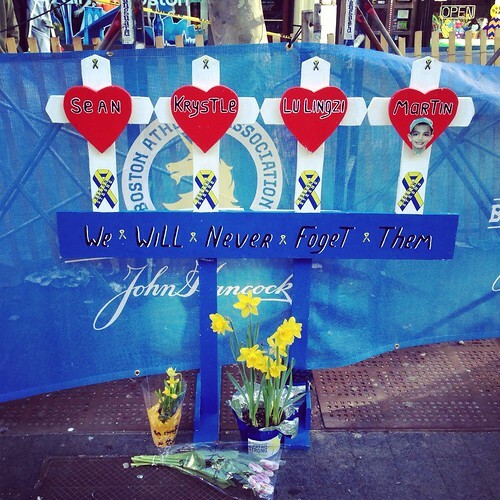 And, more than anything, I’m talking about the victims of the bombings and their loved ones. It is our day now. As soon as the impact of last year’s events hit, my husband (Steve) declared that we would be returning. Although he was able to finish the race last year, he was determined to participate again this year. “Are we going to let whoever did this defeat us, or are we going to rise above it?” said Steve Michalski, 43, who works with autistic children in Salt Lake City and who finished Monday’s race before the bombings. 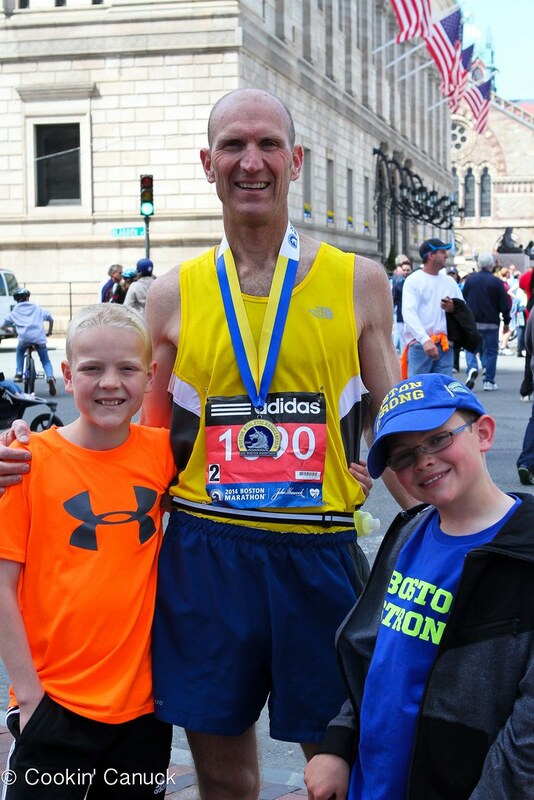 This year the Boston Athletic Association (BAA), the tireless organizers of the Boston Marathon, increased the field size from 27,000 to 36,000, anticipating the determination of the running community to show their support for the victims, for Boston and for the sport of running itself. Those who were unable to finish last year because of the bombing were rightly given automatic entrance into the race. Just like last year, the four of us packed up our things with excitement. Though this time it was also with a touch of unease and uncertainty. We were going to meet my husband’s parents when we got there, and we all hoped to make things right for our family this year, to turn the memory of 2013 into something positive. 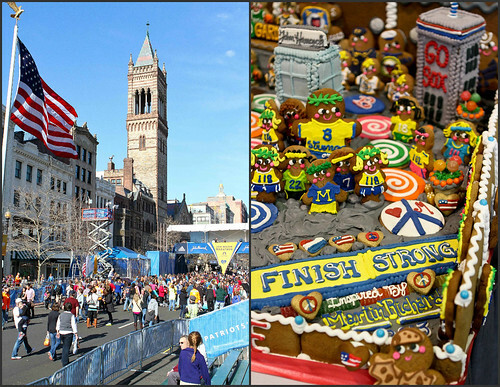 It’s difficult to capture the atmosphere in Boston in the days leading up to the marathon. It was somber, yet optimistic. Quiet, yet quivering with suppressed excitement. 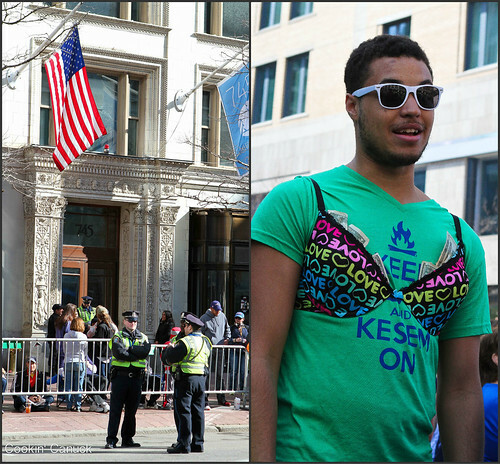 The colors of the marathon were everywhere. 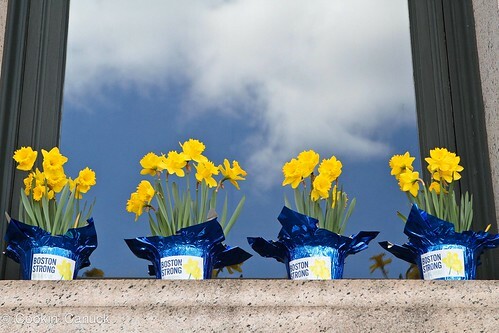 On the jackets of last year’s runners, in the daffodils displayed in almost every shop window and garden bed and, poignantly, on the memorial near the finish line. Along with many others, we made a pilgrimage of sorts to Marathon Sports, the site of the first bomb. We went to honor the victims, we went to thank the staff of the store and we went to replace the images of last year with new memories…more hopeful ones. 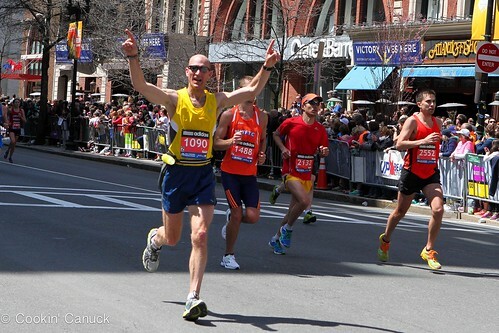 Half a block past the finish line, at the entrance to the Old South Church, I stopped. While I had been aware how close my mother-in-law and I stood to the site of the first bomb when it exploded, it was overwhelming to stand in that spot. It is clear now why we felt the ground shake so violently and why we heard the thunderous explosion while watching the plume of smoke fill the sky. It was a difficult moment. One of gratitude, one of guilt, one of sorrow and one of anger. It was important for me to see it and to be able to fully absorb the reality of that day. Our vantage point at the time of the first bomb. 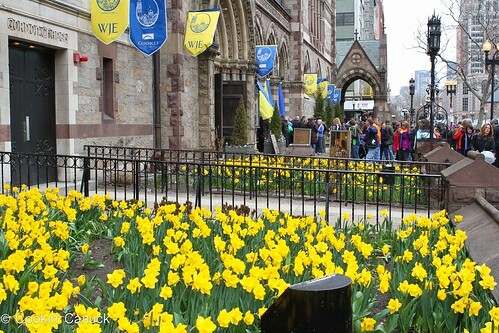 If there was ever any question about the generosity of Bostonians, one only needed to stand outside of the Old South Church a few days before Marathon Monday. 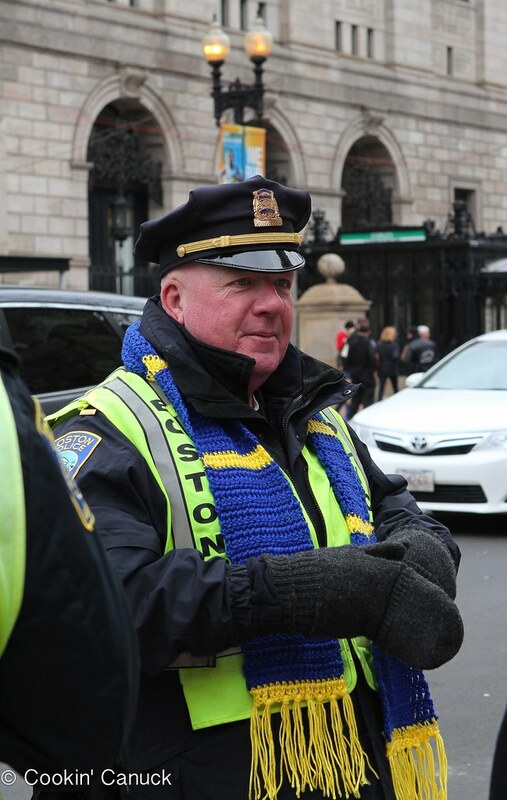 Members of the congregation handed out scarves hand-knitted by children in the Boston area to runners passing by. 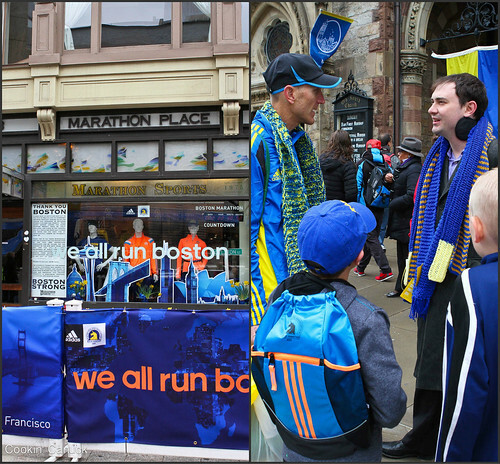 Each scarf was different, but were the distinctive yellow and blue of the marathon. Physical and emotional warmth wrapped in one heartfelt gesture. The excitement of marathon day started to build as we wandered through the expo and watched Steve pick up his bib number. The air buzzed with muted anticipation. We were there to celebrate months of hard work and training that Steve put in to prepare for the race. And then Monday arrived. Steve slipped out of the hotel rom early, gathering hugs and well-wishes from each of us, still half-asleep. As we woke up and prepared for the day, decked out in our Boston Strong hats and shirts, we watched his Facebook account. Steve’s photos of the starting area showed line upon line of police officers and emergency vehicles. 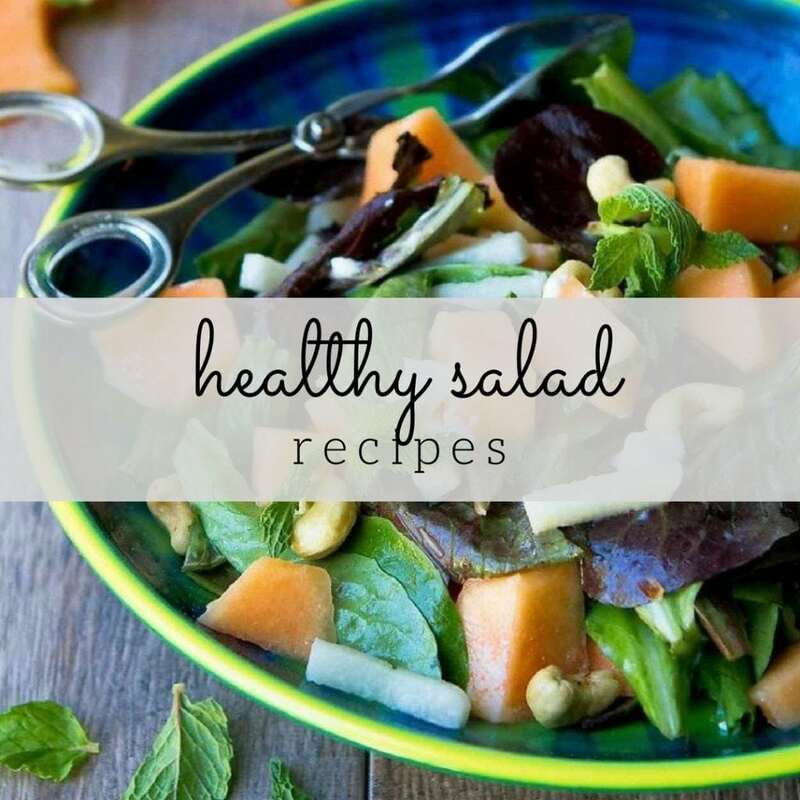 But there were also the typical images of runner bundled in sweatpants and jackets, munching on bananas and sitting on grassy patches to rest their legs in anticipation of the 26.2 miles. Police presence and raising money for the One Fund. We settled into our spots just a block from the finish line, amidst the quickly-growing crowd of spectators. Police officers and their dogs roamed the sidelines and brigades of officer rode down the street on their bikes. And yet the energy was positive, awaiting the arrival of the wheelchair athletes and the first runners. And then they came, and we cheered ourselves hoarse. Shalane Flanagan in full stride. The winner of the woman’s race, Rita Jeptoo, ran down the street as though it was effortless, crushing the course record in 2:18:57. 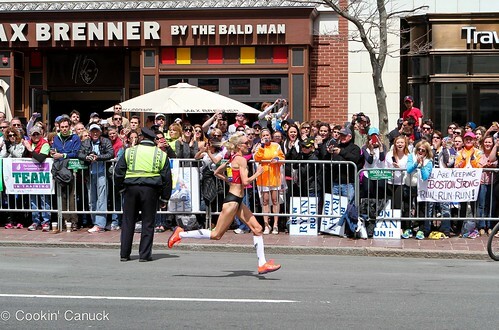 Hometown girl Shalane Flanagan ran the race of her life and set a new American course record in 2:22:02. Meb Keflezighi with his eyes on the finish line. We heard the chant before he arrived. “USA! 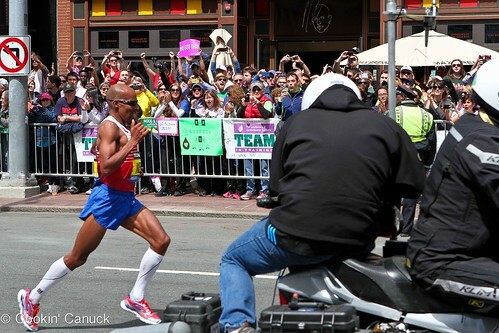 USA!” Meb Keflezighi powered down the street, looking over his shoulder at Wilson Chebet just 11 seconds behind him. 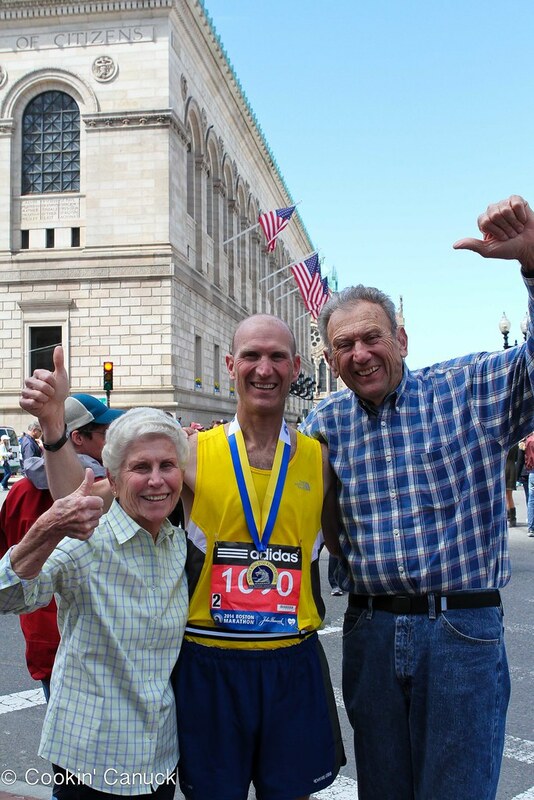 At 38 years of age, he became the first American to win the Boston Marathon in three decades. It was a moment that very few predicted, but that seemed so right on that day. Then we watched and waited, following the blue blip on our phones from the signal on Steve’s GPS watch. And then he was there, raising his arms in victory. Not his own victory, but that of everyone in the race and everyone watching from the sidelines and afar. Steve celebrating with his parents. His time, though not as fast as last year, was something to be really proud of…2:53:21. But as Steve said, it really wasn’t about the time that day. It was so much more. It was about healing and about moving forward. It was about taking back the day. And we did…we all did. It’s so wonderful that you were able to travel as a family again this year and be part of this historic race. Congrats to your hubby! Thanks, Barbara! We were so happy to be a part of it. It was indeed, Aimee! It was a week that we will never forget. What a wonderful reflection of the day. My husband just ran the NJ Marathon yesterday, so I could totally relate to the enthusiasm you and your family feels when watching your loved one run. Congratulate your husband on a phenomenal time! P.S. Your pesto turkey lasagna recipe is my absolute favorite EVER! My daughter is a vegetarian, so I just substitute meatless crumbles for the turkey now. You can’t tell the difference! Thanks so much, MaryBeth. Congratulations to your husband! 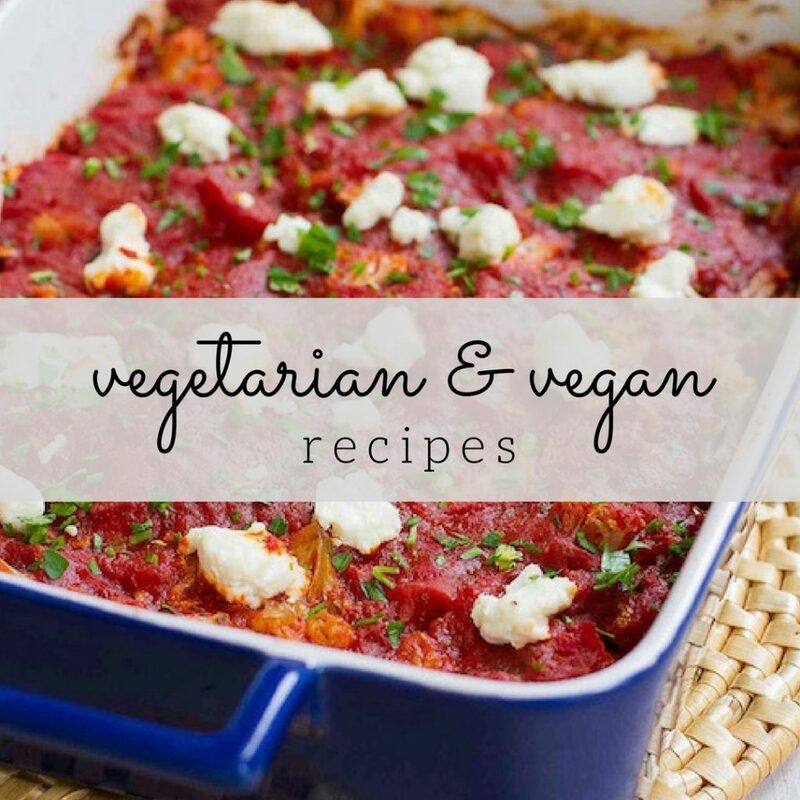 And I’m so glad that you enjoy the lasagna so much…it’s one of my favorites, too. And that’s great to know about the meatless crumbles. Thank you for taking the time to write such a beautiful tribute. Your pictures and your words make the tragedy and the redemptive power of victory come alive. What a great post. I’m so glad you guys got to experience this. Thanks, Kalyn! I feel so lucky that we were able to make the trip again and to be a part of that amazing day. Awesome! Your husband is super fast. Holy cow. 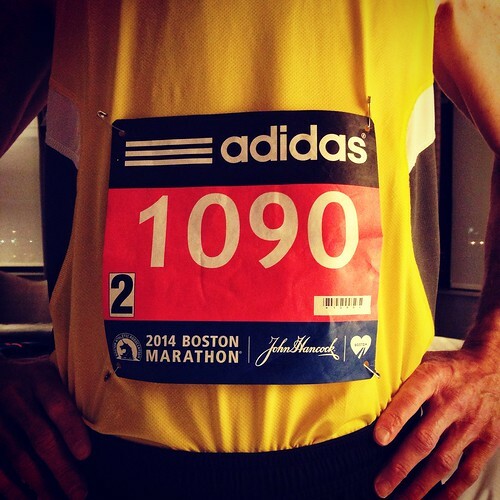 Nice post…it is so nice to read about your positive account of the boston marathon…brings tears to my eyes! Your family looks so happy in all of the pictures. Love the one of your husband with his parents. Congrats to him. I hope to be back next year to run. You can’t beat that experience. 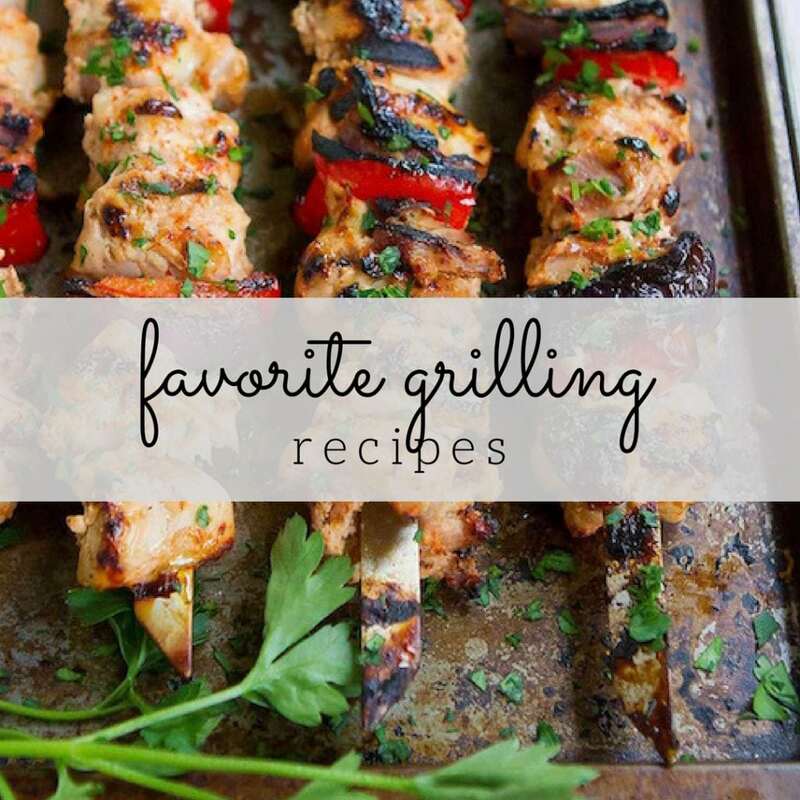 Thank you so much for sharing your most recent experience Dara! Of course, I had almost forgotten about little Martin and just saw the tribute on the Globe. I am in complete tears but it is such an important reminder to count our blessings daily. Thank you again.